This motor sport super cheap from Korea who predicted a major competitor in New Streetfighter Ducati 848, CBR 250 R, and the Ninja ZX 250R, and Suzuki GW250 to the world of motor sport in Indonesia. Hyosung motorcycles with a sleek and modern models of 125cc and 250cc. The Hyosung GT250R looks like the beautiful offspring from Suzuki GSXR and the Ducati 748. The only thing that gives away the displacement is the 250R sticker on the side fairing, and the styling you might think it's a typo! .. 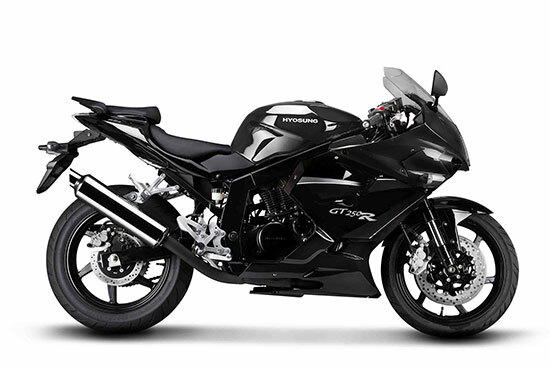 It really nyata.GT250R cylinder is supported by two strong and powerful, V-twin DOHC eight-valve engine, 249 cc.